Among all the applications of industrial ultrasonic testing, flaw detection is the oldest and the most common. Since the 1940s, the laws of physics hat govern the propagation of sound waves through solid materials have been used to detect hidden cracks, voids, porosity, and other internal discontinuities in metals, composites, plastics, and ceramics. High frequency sound waves reflect from flaws in predictable ways, producing distinctive echo patterns that can be displayed and recorded by portable instruments. Ultrasonic testing is completely nondestructive and safe, and it is a well established test method in many basic manufacturing, process, and service industries, especially in applications involving welds and structural metals. Alarm gates are often employed to monitor signal levels at selected points in the wave train to flag echoes from flaws. The high speed, fully sunlight readable, backlit display offers a full Quarter VGA resolution.Modern ultrasonic flaw detectors such as the NDT Epoch series are small, portable, microprocessor-based instruments suitable for both shop and field use. They generate and display an ultrasonic waveform that is interpreted by a operator, often with the aid of analysis software, to locate and categorize flaws in test pieces. They will typically include an ultrasonic receiver, hardware and software for signal capture and analysis, a waveform display, and a data logging module. While some analog-based flaw detectors are still manufactured, most contemporary instruments use digital signal processing for improved stability and precision. Pouch, Battery Charger, A pair of 52 kHz UT Transducer, RG 58 cable with BNC/BNC connectors, Reference Block, Ultrasonic couplant, Instruction manual. 2. With the combinations of high-energy pulser, high sensitivity receiver and high efficiency transducers, it is excellent in thick and attenuative materials. 3. 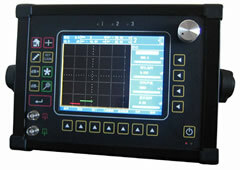 TFT color LCD and makes it easy to operate in worksite or laboratory. 4. Status messages and different color display according to measurement modes enables to ascertain present inspection modes. 5. 6 x AA rechargeable batteries enables long operation.